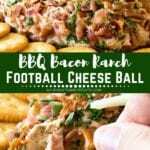 Football BBQ Bacon Ranch Cheese Ball ~ How to Make The Perfectly, Delicious Bacon Ranch Cheese Ball Recipe! 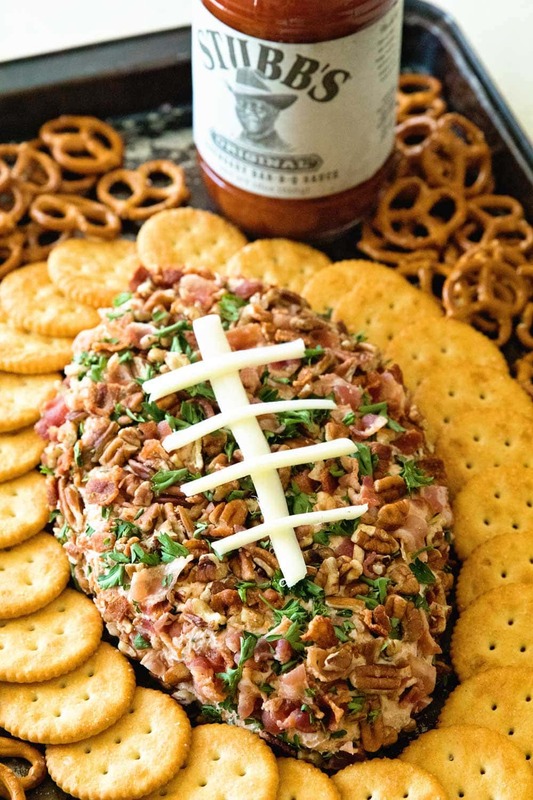 Loaded with Cheese, BBQ Sauce, Bacon, Pecans and Made into the Shape of Football! Perfect Tailgating Recipe. It can also be formed into a regular cheese ball if you don’t want it shaped as a football. The nights are cooler and there is a crispness to the air here in Minnesota, which means one thing, FOOTBALL SEASON! Well, that and many other things, but that’s what we get excited about, right? Ok, so I don’t get that excited about football but I do get excited about all the food that goes along with football. For example, these Football Scotcheroos, Football Pepperoni Pizza Dip and now this BBQ Bacon Ranch Football Cheese Ball. I have a confession to make. I’ve never made a cheese ball before. Honestly. I have another confession. Whenever I see a cheese ball I shy away from it. I am like, how is this good? I mean it’s a ball of cheese. Ok, ok, I know I’m not selling this recipe very well, am I? Keep reading, my friends, keep reading! My mom was over the day I tackled this cheese ball recipe because I didn’t have daycare for the baby, so she came over to help me out. She actually went to work on this cheese ball with me because he was sleeping. She had never made a cheese ball either! We were sipping our coffee and working together on this delicious cheese ball while enjoying some giggles in the kitchen. It was truly one of those rare moments that I’m so grateful for! The day got even better when my niece popped in and stayed for a while. While the cheese was in the refrigerator we enjoyed her stories and laughed along with her. As you can imagine, a 16-year-old girl has plenty of stories! I look back on my teenage years and they seem like they weren’t that long ago, even though they were longer ago than I would like to admit. My niece and I are pretty close because I was the “fun, young, single Aunt” for many years and I may, or may not, have spoiled her rotten. Hey, I could! That’s what aunts are for! Now, as she gets older it’s fun listening to her and keeping up on her life. Every once in a while as she’s lamenting over something I chime in, she rolls her eyes at me, and I tell her it wasn’t that long ago I was going through the same thing. Then she rolls her eyes again. Maybe I’m not as cool as I thought I was??? 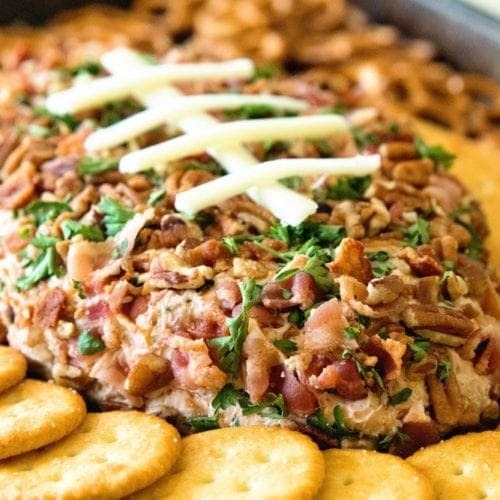 If you’re not using fresh herbs or bacon, a cheese ball will last refrigerated for a week or two! Because we’re using bacon and herbs, this will last in the refrigerator just a couple of days. But trust me, it will be gone in a snap! However, if you do have leftovers…here are some delicious ideas! Just substitute the cheese that the recipe calls for with leftover from the Bacon Ranch Cheese Ball and look at you?!! All creative in the kitchen. Love that! Don’t like frying bacon? Use microwaveable bacon! Snip your parsley with kitchen shears! After my niece took off I went back to work on the shaping of this cheese ball. I was a bit worried about this part because I’m not the most creative person. I didn’t know if I could actually get it into the shape of a football and then make it look like one with string cheese. You guys, easy peasy! Honestly, it comes together quickly and it’s not nearly as hard as I thought it would be. After you shape it you just stick the topping to it and finish it with string cheese in the shape of football laces! The first step is to combine half of the bacon, pecans and 3 Tbsp parsley. Then set that aside. Next in a large bowl beat the cream cheese with an electric mixer until smooth. Then add sharp cheddar cheese, Ranch Seasoning, BBQ Sauce, remaining bacon and parsley. Mix until well combined and fluffy, about 1-2 minutes. Cover cheese mixture and refrigerate for at least 2 hours or overnight. After that time is up remove cheese mixture from refrigerator and place onto serving platter. Shape into football. Pat bacon, pecan and parsley mixture to top and side of cheese ball so it stays on. Pull apart string cheese and place on top of cheese ball so it forms the shoelace. After I was done photographing the cheese ball I obviously grabbed a pretzel and dug into it. It was amazing! Like, I think angels sung from the heavens above! I literally yelled to my Mom, “Why on earth did we wait to make a cheese ball?” Then followed by going on and on about how amazing it was. The flavor from the bacon paired with Stubb’s Original Legendary Bar-B-Q Sauce and the sharp cheddar cheese was almost too good to be true! Stubb’s signature sauce, is the real deal, the original. It’s tangy tomato, vinegar, molasses and black pepper are gonna treat you right no matter what kind of recipe you are making! 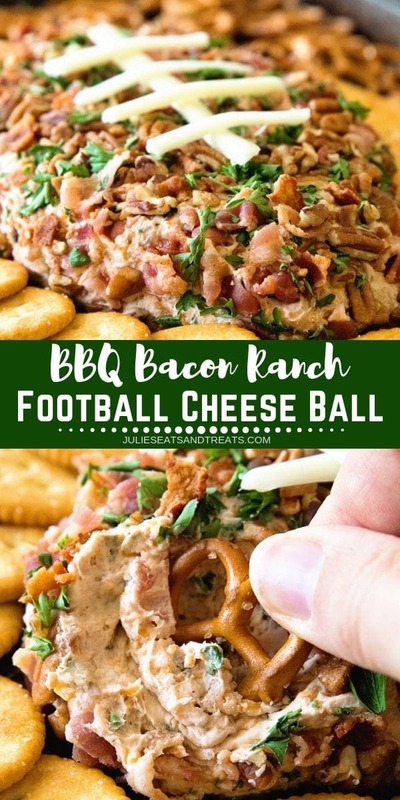 If you are looking forward to football or the food that goes with football make sure to try this delicious BBQ Bacon Ranch Football Cheese Ball Recipe! Isn’t this perfect for a party? 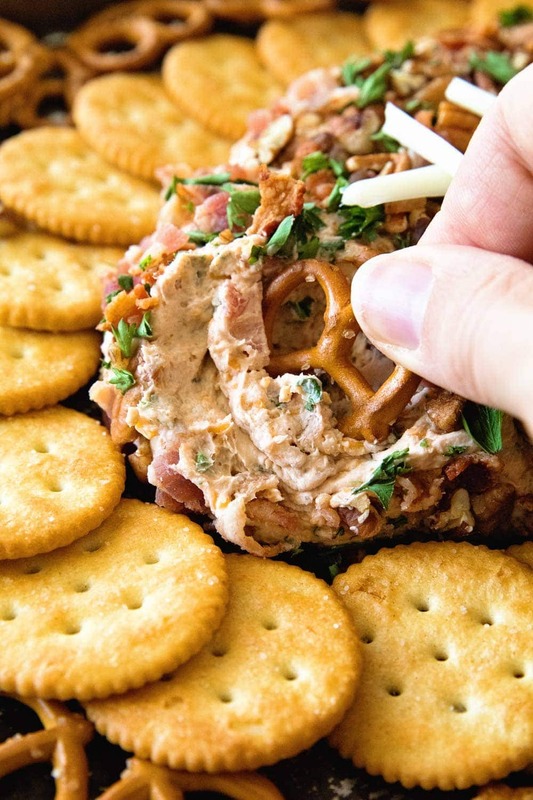 Be sure to snap photos of your BBQ Bacon Ranch Cheese Ball and tag me on Instagram @julieseatsandtreats or #julieseatsandtreats so I can see your party platter! How to Make The Perfectly, Delicious BBQ Bacon Ranch Football Recipe! Loaded with Cheese, BBQ Sauce, Bacon, Pecans and Made into the Shape of Football! Perfect Tailgating Recipe! In a small bowl, combine half of the bacon, pecans and 3 Tbsp parsley; set aside. In a large bowl beat the cream cheese with an electric mixer until smooth. Add cheddar cheese, Ranch Seasoning, BBQ Sauce, remaining bacon and parsley and mix until well combined and fluffy, about 1-2 minutes. Remove cheese mixture from refrigerator and place until serving platter. Shape into football. 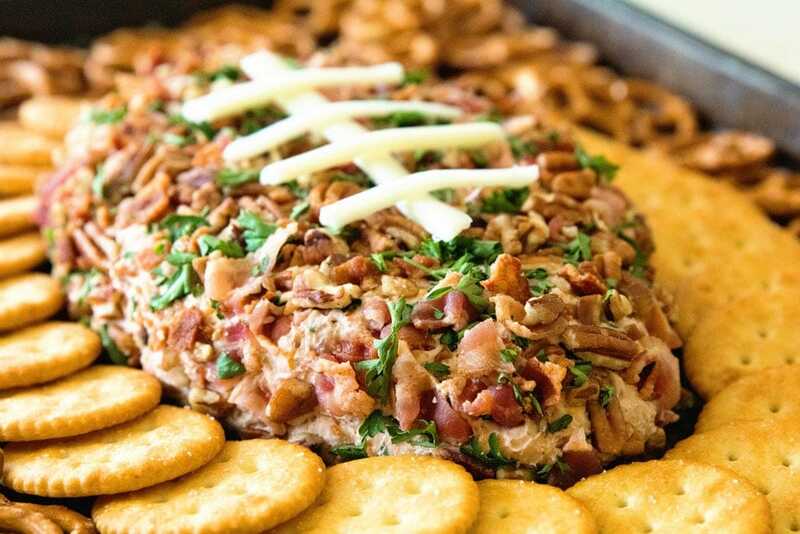 Pat bacon, pecan and parsley mixture to top and side of cheese ball so it stays on. Pull part string cheese and place on top of cheese ball so it forms the shoe lace. Julie, this looks so pretty! I think if I made this I would not let anyone touch it haha. Where does the chicken fit in? There’s no chicken in the recipe? You could put cooked and shredded chicken in the cream cheese mixture. OMG yummmmm! I’m drooling just thinking about this. Love that presentation! I made this for the Super Bowl and it was a total hit with everyone!